South Dakota Senators just agreed to make texting while driving a crime, and more and more states are following suit, adding to the roster of thirty-seven states which have already made texting while driving a primary offense (which means that a police officer can pull you over if they see you texting while driving) and four states which makes it a secondary offense. This move of the government is hardly surprising, after all, there really is no sound reason in allowing texting while driving. But why is texting while driving dangerous? There are many reasons, primary of which is that driver-texters are distracted drivers, their minds being on their phones more than on the road. They often become less careful and more reckless, and this may be a contributing factor to road mishaps and accidents. Another reason is that younger drivers (mostly in their teens) are the biggest texters, and this is a point of concern. Younger drivers are bereft of driving experience, and this, combined with being distracted, is not a good mix of attributes to have on the road. Yet another reason is the science behind texting, explained aptly by the National Highway Traffic Safety Administration (NHTSA). It emphasized that whenever a person reads a text message, he or she looks at his or her phone for 4.6 seconds. 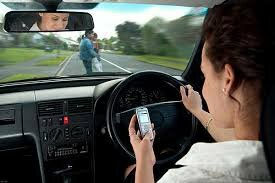 Now this may not sound like a substantial amount of time, but get this: If you do so while driving at a speed of say, 55 kph, looking at that text message is like driving through the whole length of a football field with your eyes closed. So next time you drive, do consider turning off your phone, folks!